Do you have dry mouth? If so, there are several solutions out there that can help you out. One way is by avoiding use of commercial mouthwashes. There are doctors who will discourage the use of mouthwash for dry mouth. Most mouthwashes contain chemicals that can affect the production of saliva in your mouth. Once this happens, you will not only suffer from dry mouth but from other complications such as bacteria production, toothache, sore throat, and cracked lips. But what if you are really fond of using mouthwash? Does it mean that you have to forego it? Well, the answer is no because there are mouthwash for dry mouth that contain just the right ingredients to maintain the natural pH level of your mouth and prevent it from drying altogether. 1) Biotene Dry Mouth Mouthwash: it contains four different types of enzymes that will help stimulate saliva flow and help fight oral bacteria. It is (of course!) an alcohol free mouthwash, and it contains xylitol, which is a well-known inhibitor of bacterial growth. In addition, it also contains zinc gluconate, which has been shown to help prevent plaque and tartar build-up, as well as reduce metallic or sour tastes in the mouth. Biotene mouthwash is very gentle to the mouth (no burning sensation). It tastes sort of sweet and has a very light minty flavour. It is quite amazing how just a tiny amount gargled for less than a minute had the power to lubricate my mouth for hours. Biotene products are now recommended by many health professionals and have been shown to be very effective to treat xerostomia. 2) Oasis Moisturising Mouthwash: Oasis (from Sensodyne) is also alcohol free and it helps stimulate saliva production by using (what they call) Tri-Hydra Technology, which helps protect from dryness, lubricates, locks in moisture and helps prevent bad breath. Contains glycerin which is a moisturising agent. Instead of xylitol (like Biotene and BioXtra), it contains sodium saccharin. It is often said that some users would rather use something containing xylitol (proven health benefits) than something which contains sodium saccharin (there is a bit of controversy surrounding this component). 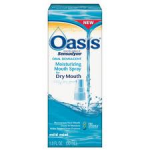 Having said that, Oasis Moisturising Mouthwash does what it says on the label and really helps with xerostomia symptoms. Flavour is also very mild (minty) and leaves mouth fresh for a few hours. 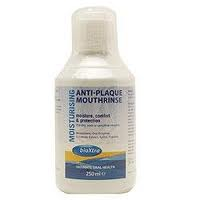 3) BioXtra Moisturising Anti-Plaque Mouthrinse (available in the UK): like Biotene, BioXtra mouthrinse contains a unique blend of enzymes to help increase saliva production. Other useful ingredients it contains (when it comes to preventing dry mouth, dental decay, plaque and bad breath) are xylitol and fluoride. It is also an alcohol free mouthwash. It is really impressive because it is a very gentle mouthwash that leaves a very fresh and moist feeling to the mouth straight away. The effects last for a good three to four hours during the day and all night if used before bedtime. The fact that it contains enzymes, plus xylitol, plus fluoride and is alcohol free makes it even more lovable. Dr Fresh Orazyme Mouthwash: it’s alcohol free, contains a blend of 7 different types of enzymes, contains xylitol, and zinc gluconate. 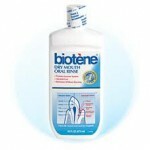 Its ingredients are very similar to Biotene’s so it should be quite an effective mouthwash. Nowadays, more and more manufacturers have created mouthwashes specifically for those who like to use the product but are after safer choices. There are mouthwashes out there that contain green tea as their main ingredient. Mouthwashes as such are very safe to use every day. They keep bacteria at bay and ensure that you have fresh smelling breath all day long. Among its other uses, apple cider vinegar can be used as a good mouthwash substitute. The best part about using this particular product is that it is widely available and very cheap. Use a teaspoon of it with an 8 oz. glass of water and gargle every night. Citrus juices can improve your salivary glands and keep your mouth moisturized. They not only do wonders, but they taste really good as well. If you have oral dryness or one or more of these dry mouth symptoms, consult a health professional. Only your doctor or dentist can determine the causes and the right course of treatment for your dry mouth.